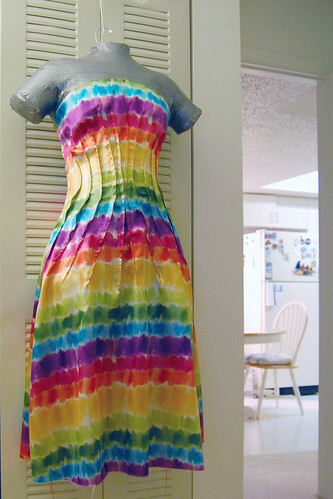 Rainbow dress, originally uploaded by fmirela. Congratulations to BurdaStyle Pattern competition winner, JJ! She created a pretty shirt in eggplant purple which I love! I can’t wait for the pattern to be released and sew it. This is what I’ve secretly been working on for this contest: The sun dress! Nevermind the crazy fabric colors! I got it cheaper then muslin from JoAnn and it had almost the same drape as taffeta. Yes, It is supposed to be used as windows drapes. I have started to see the beauty in this swamp called the Everglades. These hot summer days inspired me to create this simple dress. The idea of the darts came from the warm rays of the sun. The darts create the illusion of a corset for a fun radiant summer dress, perfect for pool parties. 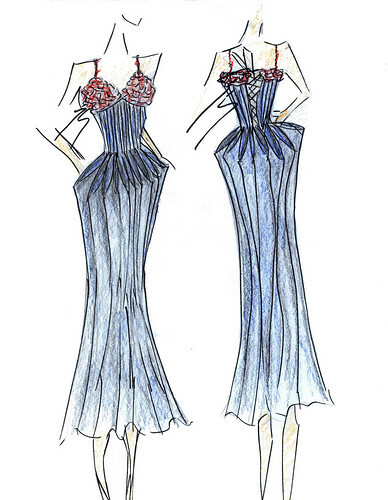 The round shape of the heat ball inspired the top corset line and the volume of the circle hem. For lots of volume, I picture this dress sewn in taffeta, very shiny like the sun. 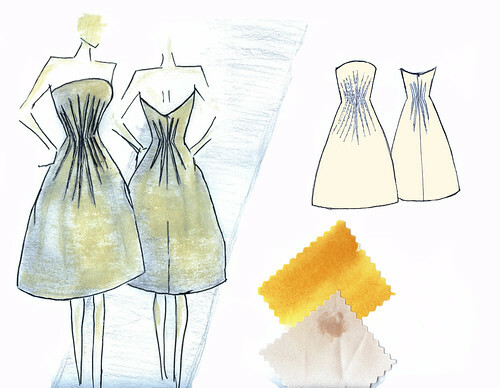 A light yellow or ivory would work best for an elegant dress. It may be worn with a tulle underskirt. A medium weight natural linen would totally change the look into a more modern romantic day look, with a wavy ruffle sewn onto a shorter hem line. 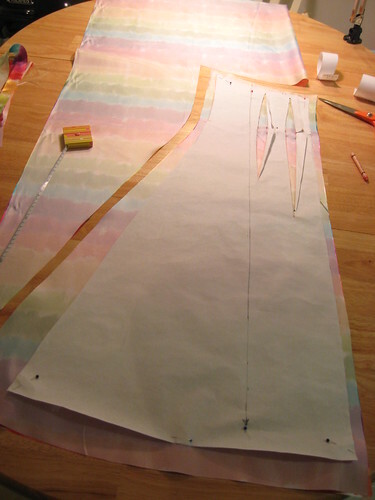 To enhance the cut of this dress, use a solid color for the fabric and contrasting top-stitching, sew the darts inside out, or add piping or narrow ruffles in the center of the darts. I’ve started to drape paper over the dress form. I pinned down the center line vertically, placed a pin on the waist line and pinned into the apexes. The first dart is placed in the middle of the front left half, with the tip of the dart pointing to the apex, the center of the dart close to the center line and the other tip pointing outward. Then I started pinning more darts, closer to the center and to then to the lateral. I’ve made the center darts longer then the other; their ends further apart and the centers closer together, at the waist line to create an hour glass shape. I made sure the bust is nicely framed by the darts and the neckline is rounded, higher in the center and lower under the arms. For a tighter fit and a narrow waist line, I added a few darts in the back as well. The round line of the neckline continues as an S shape that become concave in the back, going down under the bra line. 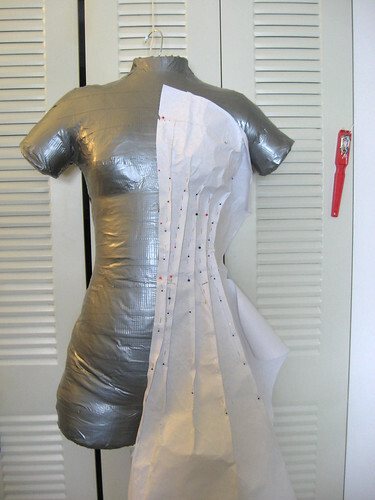 After all the pinning on the dress form, I have matched that the front and back meet underarm and at the hem lines. I have double checked the fit and transferred this first version onto new paper for cleaner lines. Hurray for BurdaStyle and may there be many contests as challenging and fun as this! Crochet Flower Dress, originally uploaded by fmirela. The idea behind this dress is combining the old art of hand created fabrics and the new into a dress to be treasured by a sophisticated woman. Inspiration came from a friend of mine who does crochet. Thanks Danny! She sent me her delicate work and my task was to combine the crocheted bustier with fabric and make an elegant evening dress. I tried to create something interesting and unusual, without being too overwhelming, while keeping the beautiful crochet in the center of attention. 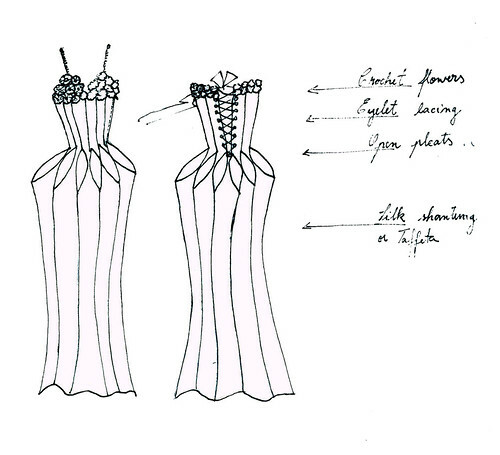 A bee shape is accentuated by the pleated corset and petals of fabric folds created as the pleats open up near the waist line. Silk yarn for the crochet bustier and silk shantung or taffeta, with firm and crisp weight fabric is suggested to hold the sculptured design lines. I’m going to start working on creating something similar (I hope) for Danny, I’ve found the almost perfect red silk (could not find the blue version so…red will do). Thanks to Burda Style and this competition I have found a new hobby: fashion drawing. Even if I’m far from being good at it, I can see how this can help with the design decisions. Also it’s a good way to stay focused on what I’d like to create someday. Burda Style’s design competition is over and they will be anoncing the winner soon! I can’t wait to see the results and what everyone has made! Good luck to all the talented designers! This is my submission and here are a few other fashion illustrations I’ve made and please feel free to tell what you think! Cape Florida Lighthouse, originally uploaded by fmirela. I knitted the red to on my brand new Bond America Ultimate Sweater Machine. Here I am staying until midnight to knit more rows, just so I could wear it the second day. The pattern is from Burda World of Fashion issue 06/2007, model 140. I have to say I changed it a bit, as you can see the eyelet lace design is reduced to only two rows and I added a ribbon for some support inside the double crochet at the neck line. I used this smooth cotton yarn from Coats named Catania (50g = 125m, color code: 0115) with the smallest plate I have for the machine. This is my first project on the machine and my first time knitting since seventh grade. I went through the learning process, knitting the square, measuring and adjusting the pattern, increasing, decreasing, casting on, binding off… Once I’ve done all that knitting seamed pretty straight forward. 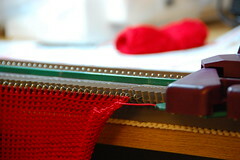 The stockinette stitch is really fast to do, while other designs like eyelets are still done manually on this machine. Either way I love it and am convinced that with practice I’ll soon be moving forward to more elaborate designs. The hardest thing so far for me is finding the right yarn and making the knit fit. I have read that blocking the knit (either by washing, shaping it to size and letting it dry or steaming it) keeps it from curling. After blocking, seaming the pieces together went smoothly. Still I do not plan on wearing this top for more then a few hours at a time. This cotton has absolutely no memory, snapping out of shape and stretching in all directions. I’m thrilled about the machine, got some more cool yarn and will definitely give it another try! I’m so going to steal my mother’s collection of Verena magazines and I’m also thinking of subscribing to some knitting magazines…have not decided which, please help a knitbie decide! Knitty.com offers a reach collection of free online patterns for all seasons, men, women and kids. I browsed around and printed a few. Now it is time to see if I can read them and choose my next project. I’m still wondering what’s the best place to find yarns in the US, how does silk or linen behave? Are they suited for hot steamy Florida summer weather? It is so steamy around here that maybe I don’t have to block my knit anymore, simple going outside should steam it enough. I had to do some knitting for a class I took in school. I made a top I might still have in a closet back home. Passing that class meant finishing a project during the trimester and that is almost how long it took to “finish” the top. Of course my mom helped me out with speeding things up. My knitting was uneven and this made my mom’s job harder as she tried to imitate my clumsy work, so the teacher would not notice. I passed of course! Now I wonder if that top would still fit me! ?I liked knitting, but mostly the knitting that my mother did. I was not really thrilled about my work. It was uneven and took forever to finish. When sewing it is possible to finish a project in a matter of hours. As a seamstress I was sometimes thinking: “Oh! how many things I could have sewn instead!”. But soon I was in the mood again and realized knitting takes time and patience to create pretty useful things out of plain yarn. You create the fabric out of yarn, already shaped and sized conforming to a pattern or just your imagination. Yarn is the medium and you are the sculptor.Many special thanks to my husband Marius who listened to my wishes and gave me the best present ever! It made me realize that I do love to knit after all, since speed is not an obstacle any more. The bond ultimate sweater machine is not as automated as I would like, basic and simple to use. My mother has a similar wooden knitting machine that I cannot wait to see again when I get to Romania. I remember my mom did not use it that often as it had no instructions and doing lace stitches is time consuming. Maybe sharing Bond’s knowledge with the capabilities of the wood version will be useful 🙂Burda has these incredible patterns for knitting and crochet in the latest magazines. I’m familiar with Burda patterns for sewing, but with knitting and crochet it is like learning two different languages. First I went through the process of understanding some of the stitch types, than knowing the abbreviations for them, then the symbols in the charts.I strongly recommend The Complete Encyclopedia of Stitchery for anyone who is considering learning to crochet or knit. This book has it all from tatting to crochet to macrame, knit, rugs, embroidery. Seams that you can read it online from Google Books, just follow the link above. For crochet NexStitch has these amazing videos and expanations on all stitches you can imagine and wonderful patterns she creates. The other day me and my colleague Oana were reading a German Knitting and Crochet magazine ModisheMache, from 1990, trying to understand what all the signs in charts mean. I’ll learn these languages someday slowly but surely. and the red wrap from Burda May issue. Hats off for knitters and crocheters! This is not as easy as it seams! I’ll post back pictures with the progress of the red top 140! Denim Corset, originally uploaded by fmirela. I sewed this corset out of some leftover stretch denim fabric I had after making a skirt. The pattern is out of La Mia Boutique issue April 2004, with a few adjustments. I’ve altered the pattern, made the back pieces slimmer in the center back, added the eyelets and lacing instead of a zipper. Only after I realized I did not sew the skirt using the red top stitch thread, but they go together nice even so. Maybe the lace should have been red! I have warn this for my birthday party and felt very comfortable, had a nice time too! I got the best present ever! No to brag but really! The Vogue Sewing book, a crochet with beads book, plus the Ultimate Sweater Machine, not to mention the cosmetics and gold pearl earing and the most amazing flowers! Thanks to everyone for a lovely time and all these out of this world presents!